I think we all know what the main problem is with the Twilight mania sweeping the English-speaking world right now: Ugly hair. 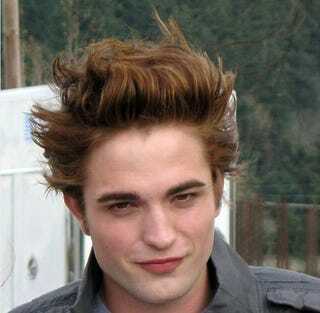 Seriously, what the hell is up with the hair on heartthrob vampire Edward (Robert Pattinson)? The guy is undead, OK, but does his hair have to look like roadkill? Apparently, yes. Edward comes from a long line of ugly-haired Euro-American vampires in cinema, and we've got a rogues gallery of the worst vampire hair imaginable for you, below. Here is proof that the ugly vampire hair trend did not in fact begin with Bela Lugosi in the early-1930s version of Dracula. In fact, the Hungarian hottie had really lovely hair - thick and black, pomaded back in the style of the day. Yeah he had that peaked hairline, which became a kind of Dracula staple, but you can see from this lobby card advertising the film that his hairline was pretty subtle and definitely not ugly. Now if you want to see where the seriously egregious hair action begins, you have to consider the Buffy the Vampire Slayer spinoff show, Angel. Star David Boreanaz, pictured here as Angel the crime-fighting vamp, had hair whose fail is nearly as epic as Edward's in Twilight. What kind of a style is that, people? It's like a wilting fauxhawk or something. And I just love how the light catches in the goo of his hair product. Snazzy. Obviously we couldn't forget the vampire Spike, also of Buffy and Angel. I think show creator Joss Whedon basically has it in for guys with hair. Spike's hair is probably the closest thing I have ever seen to a style that completely resembles that of a Ken doll - it's blond, it doesn't move AT ALL, and you can practically see plastic grooves carved into it. Then there's the whackadoo category of vampire hair, which of course Francis Ford Coppola is happy to bring in Bram Stoker's Dracula. Here you can see our pal Dracula, played by mega-tasty Gary Oldman, in his "elderly" mode. His hair basically looks like two giant tumors on top of his head. Later he gets young and has an acceptable (for the era) grunge haircut - shoulder length, wavy brown. But when he's in his more vampy state, he has the head lumps. Why? The guy is a freakin' shape-shifter and he picks tumor hair? Poor Wesley Snipes - he's stuck in the lame third movie of the Blade series, and they make him have this lame hip hop/modern primitive look for his vamp head. Head tattoos? At least they didn't make him shave "daywalker" into his hair I guess. Here's another classic vamp look, from Klaus Kinski in the 1970s version of Nosferatu, directed by German maniac Wernor Herzog. The rat teeth look great, and I think Kinski really works that bald head in a way that's both classy and scary in an "I sleep in dirt" way. Obviously Edward could never rock this look in a million years, and of course even if he tried he'd lose that crucial tween girl demographic. Sorry, Klaus and Wernor, you got the hair right but it will never work in Hollywood. Stay in Europe where people will accept you for who you are. And since we're talking 1970s, we should end with another great moment in 70s vamp hair - brought to you by George Hamilton in the comedy Love at First Bite. Not only does the movie contain the only Jewish vampire joke I've ever seen, but Hamilton has got the right attitude for this hair. He knows it's ridiculous, doesn't try to be emo, and thankfully does not even attempt to do any kind of fauxhawk crap even in jest.